Let me start off by saying that I am an absolute sucker for lady singers in loud indie rock bands (YYYs, Sleater-Kinney, Sleigh Bells, etc). After a strong recommendation from a coworker, I bought The Joy Formidable’s debut album The Big Roar shortly after its release in 2011 and was impressed. I loved that they were aiming high on every track. Soaring vocals, massive guitar riffs, and a constant driving escalation of sound defined the experience of The Big Roar. After a number of listens a few tracks stood out in my memory but the rest seemed to fade quickly. It is a solid record but it ultimately falls a little short. 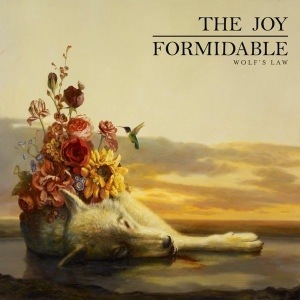 Now with their sophomore effort Wolf’s Law, The Joy Formidable are back with another ambitious record that still hints at greatness but again comes up short. I definitely like the album, don’t get me wrong. But after repeated listens, I find that I can’t remember any moments or melodies outside of a few stand out tracks. It’s always weird when I hear an album that has no bad songs but also, no great songs. Its an empty experience to hear an album that elicits an almost entirely neutral emotional response. From start to finish this is a decent album but it rarely ascends beyond that. I feel like this is a band that knows they want to swing for the fences but is still struggling to identify why. One of the biggest things holding them back is their constant reliance on a well executed but familiar aesthetic and build. Once you’ve heard a few of the tracks, you’ve got a pretty good idea of how the rest of the album is going to sound. A few tracks stand out from the rest. The hilariously titled “The Maw Maw Song” features vocals and guitars mimicking a heavy riff that sounds exactly like “Maw Maw”. It’s not a great song at all but it’s one of the few that really stand out and it gets some bonus points for that. “The Leopard and the Lung” on the other hand is the albums only really stellar track. It’s a dynamic track that features some of the loudest and softest moments on the whole album. The song builds and releases to frisson inducing climax and it gives us a glimpse of The Joy Formidable at their absolute best. My CD collection is full of albums like Wolf’s Law; good bands doing good work but failing to meet my ever rising expectations. Had I discovered this album during my formative teenage years, I no doubt would have had a different take on it. I think the Joy Formidable have a healthy share of potential but this album just doesn’t have the kind of staying power I am always listening for. Ever the optimist, I eagerly await their next album with the hope of hearing their full potential realized.